Would you like Extras with your Hangouts? Hangouts are one of the coolest features of Google+. But have you tried Hangouts with Extras yet? Here's a quick tutorial for you. To start an 'extras' hangout, click on the Start a Hangout button on the right sidebar and look for the Hangouts with extras link just below the Hang out button. In the next screen, add a name for your hangout (optional) and add your circles (or make it public) and click on the "Start Hangout" button. - If you want people to know what the hangout is about before they enter, use Hangouts with Extras. The name you enter while creating the hangout will be displayed in the invite. Which one are they using? If you see the message "______ is hanging out", they are using regular Hangouts. Join in and watch some videos! 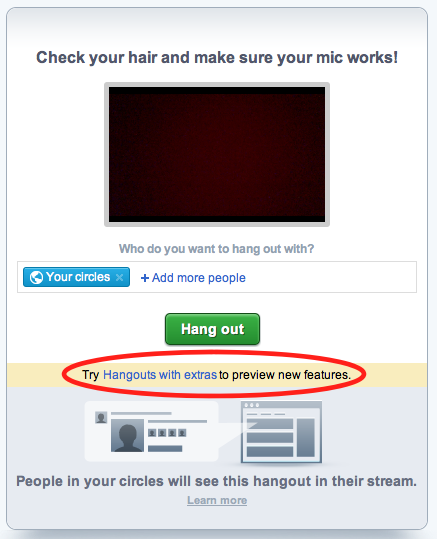 If you see the message "________ has invited you to join a hangout", they are using Hangouts with Extras. More info on Hangouts in the Google+ Help Center.